Maryland was one of the first states in the nation to create a state council for the arts in 1967. This was the outcome when the General Assembly enacted legislation declaring it the policy of the State to strive to create a supportive and nurturing climate for the arts. The General Assembly formally recognized that the arts are a vital part of Maryland's culture and heritage. 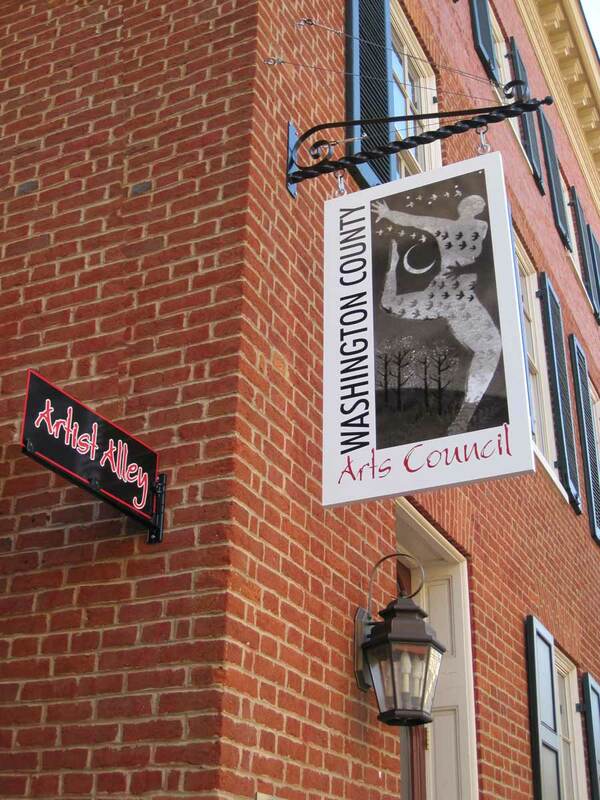 The Washington County Arts Council, Inc. (WCAC) was formed on October 2, 1967 to aid and advance the cultural arts in Washington County, and to integrate the arts into the total life of the communities it serves. The Washington County Arts Council was officially incorporated in 1968, making it one of the very first such state agencies. When Maryland became the first in the nation to establish a state-wide Arts & Entertainment District program in 2001, downtown Hagerstown was in the first class of communities to be designated as such, providing various tax incentives for arts enterprises in the heart of downtown. In 1980, the Board of Washington County Commissioners authorized the Department of Parks and Recreation to serve in an administrative capacity for the Arts Council, and allotted the WCAC two desks in the County office building in Hagerstown. Sandra Wantz was the first Council administrator. With her departure to take the lead of the newly-formed Maryland Symphony Orchestra in 1982, the very first Executive Director of the WCAC was hired. Lieba Cohen began serious transformation of the Arts Council’s mission. Under her direction, when there was no comprehensive listing of local cultural events, the Washington County Arts Council, Inc. began publishing one. The WCAC established the Hagerstown School of Ballet when there was no ballet study available. Ms. Cohen established the annual Park Arts Festival, a showcase of visual and performing arts in Hagerstown's City Park. From her tenure to today, the WCAC has been fortunate to have had a series of dedicated and talented directors including Barbara Spicher, Liz Lay, Kevin Moriarty and Mary Anne Burke. In 1982, the WCAC published the first volume of the Antietam Review, a journal of creative prose, which was the first opportunity for area writers to have their talents expressed in print. The Antietam Review had a very popular and successful run with a national reputation for excellence, and it continued publication until 2006. The organization's management made the decision to halt publication based on escalating costs and staffing factors. Plans to re-introduce the magazine as an electronic publication may be considered in the future. In the late 1980’s the WCAC Board of Directors began a long term of growth and development of other community-directed programming. In 1988, the WCAC continued its focus on other community-directed programming and the Community Arts Development Program was developed, and continues to this day. The Community Arts Development Program grants funds to support culturally and educationally significant projects of local arts organizations. In the late 1980’s, the WCAC also established its own gallery space in downtown Hagerstown. The WCAC gallery has found its home first on West Franklin Street, then on S. Potomac Street followed by a move to W. Washington Street before finding its current home in the historic Walker House, a Bowman Development property at 34 S. Potomac Street. At present the WCAC is funded in part through a grant from the Maryland State Arts Council, the Board of County Commissioner of Washington County, the City of Hagerstown, memberships, donations, sponsorships and an annual fund raiser in addition to various community grants. The Washington County Arts Council, Inc. is governed by a Board of Directors comprised of members representing the arts, business and education community. The officers of the Board are the President, Vice President, Secretary, Treasurer and Past President. Board members are eligible to serve two three year terms. Throughout its history, the Washington County Arts Council Inc. has followed the vision of its founders, to nurture the arts in Washington County, keeping the “future bright for cultural life in Western Maryland.” Its mission and standards have remained unchanged: to enrich the cultural, education, economic and social life of the community. Its 2006-2008 Roadmap and subsequent strategic plans have set WCAC's goals: advocacy for arts funding and economic development; programming and presenting; Arts-in-Education; Community Arts Development; In-House Programs—the exhibit and shop galleries; community outreach and communications; an artist registry, an arts calendar and membership. The Gallery Shop of the Washington County Arts Council, Inc has been revitalized as a part of WCAC’s strategy to provide both financial support for the arts and visibility for the organization. The Gallery Shop will make a difference for the future of WCAC as it provides both exhibit and “shop” space for area artists to exhibit and sell their art, adding to the area’s economic development. The Gallery Shop has become a sustainable revenue source for WCAC as it carries out its mission to nurture the arts and contribute to our community’s quality of life. WCAC is currently in a prominent location in the heart of the Hagerstown Arts and Entertainment District, at 34 South Potomac Street, where downtown workers and visitors can enjoy exhibit and shop galleries devoted to the work of artists of Washington County and the surrounding tri-state region.